Improve your musical setup with a jitterfree masterclock. 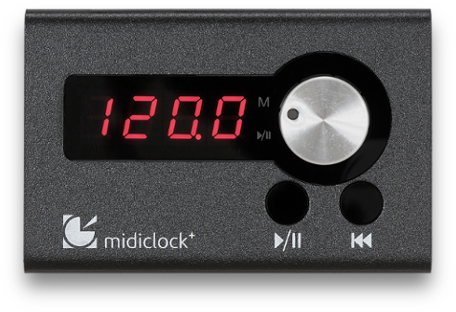 The midiclock⁺ generates incredibly accurate MIDI Clock messages, DIN Sync & Analogue Clock pulses in a range from 40-300 BPM with a jitter of max. 500ns. Improve your musical setup now by removing clock jitter and get rid of sloppy timing. Two DIN output sockets connect to your gear. Each of them can be configured individually to MIDI Clock or either DIN Sync (sync24) or Analogue clock (8ppq). Clock signals can be distributed to numerous slaves by using MIDI Thru boxes, DIN Sync hubs and modular multiples. During playback, the midiclock⁺ is always able to resync all MIDI Clock gear on the next downbeat of a 4/4 time signature. If one of your slaves gets out of sync by any reason, just push the resync button and everything is aligned again on the next downbeat without stopping your performance. 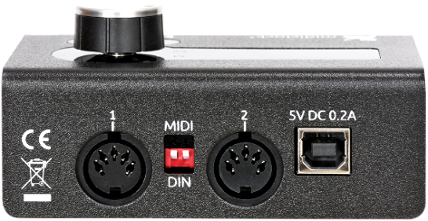 Each of the two output channels can be configured on the back of the device to send MIDI Clock and either DIN Sync (sync24) or Analogue clock (8ppq). The clock signals generated by the midiclock⁺ have a jitter of max. 500ns, which is up to 50.000 times more accurate than a MIDI Clock signal from a computer. During operation, a large and bright display shows the current tempo, which can be changed easily with a rotary encoder. The unit is powered by any universal USB charger or from a computer in your setup. Change the tempo in two operating modes: While using ‘Live’ mode, the BPM change immediately by turning the knob. Use this mode if you want to make smooth tempo changes in your performances and are aware, that every turn of the knob changes the BPM. In the ‘Normal’ mode, the changed value must be confirmed with a single click of the encoder. This mode is perfect to set your tempo once and simply need a stable clock signal. Accidental turning of the knob doesn’t affect the BPM.